For the life of me I cannot understand how people eat oatmeal in the morning. As a kid I hated it and I refuse to even try to eat it now. It’s just nasty as hell!!!! It’s just a gray nasty lumpy mush that sticks to the bowl. It looks like it has already been eaten… kinda like leftovers in ya fridge. When I see the box of Quaker oats in the store, I just frown. I know some folks who eat nothing but oatmeal in the morning and it’s unbelievable to me. They put butter or cinnamon or raisins or brown sugar or rack of other stuff in it. Nasty is nasty and you can’t change that by adding a bunch of stuff to it. 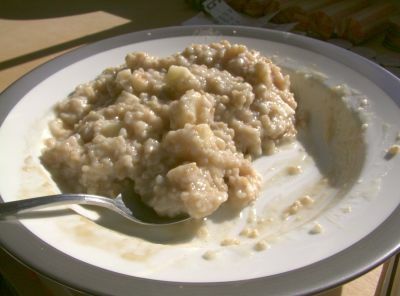 The heck with oatmeal… gimme some Cream of Wheat!!!!!! 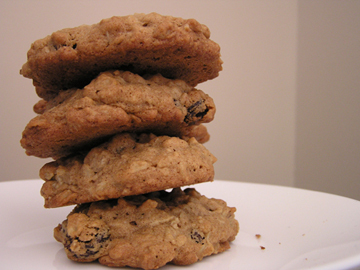 On a side note: I love me some oatmeal raisin cookies!!!!! Yeah… I took my oldest niece to the zoo today and what an adventure. It was in the 90’s in the DC area today and it was kinda hot out there. Since taking my nieces to the Universoul Circus last month, I promised the oldest that I’d take her to see the animals again. So I picked her up around noon and off we went. The whole entire ride all she talked about was animals and the circus. Everytime I said something about the zoo she started crying. I guess she really liked the circus after all! Anyway, I found a parking space on the street by the zoo and we started out adventure. Halfway to the entrance I was sweating like a mad dog and realized that I had forgotten to bring a towel. Boy what a mistake that was. For the next 3 hours we walked and walked and walked and walked and walked. I kept asking her if she was tired and she’d be like “No… let’s run”. After making the rounds of the entire zoo I finally gave in a bought her a firecracker popsicle. We sat down on a bench by the Monkey House (bad move) and chilled for about 10 minutes. No sooner had she finished that popsicle and back in full gear. The brief intermission we took on the bench allowed me to cool off, but the smell in the air was killin’ me!!! But she wanted to see the Gorilla as she ate her ice cream. Don’t ask me why. So we start walking again, she sees the elephants and wants to go back inside the Elephant House. Lord, this place smelled worse than the Monkey House!!!! It was so bad that she noticed also. saying “Ewwwww Uncle Greg, it stinks in here”. But she wanted to stay nonetheless. The baby elephant was up in there wildin’ out and everybody pulled out there cameras and camcorders. After that calmed down we went to see the Panda Bears one last time before leaving. Sensing that we were getting close to where we started, she started giving me the sad face. Better yet, she looked at me and said “I’m sad”. Now I couldn’t just leave the zoo on that note right? So we walked to the gift shop and I bought her puzzle (she loves puzzles) with a lot of animals on it. She still had that “I don’t wanna go home look”, but it was not as bad as before. I was tryna get outta DC before rush hour hit and we skipped down the sidewalk to the car. I put her in the car seat and off we went back to my sister’s house. I think I might have gone 3 blocks when I looked back and saw her fast asleep in the back seat. It was at that very moment when I realized just how much joy I had brought to her that afternoon. I must say… I love being Uncle Greg!!!! !